Mavericks: Proving Grounds is an ambitious take on battle royale, with player counts quadrupling the genre standard and highly detailed, CryEngine-powered graphics. Despite the increased fidelity and expanded features, the developers plan to keep updating the game at a frequent pace – just as frequently as Epic with Fortnite, and maybe even quicker. “What Epic is doing with Fortnite is definitely setting a good starting point there. They’ve been quite impressive with keeping content going up fast,” James Thompson, CEO of developer Automaton Games, tells us. “That’s our baseline. Yes we have a game that’s more high fidelity in a way, so because of the kind of game you’d expect it to be slower to iterate, and we’ve seen other battle games have been super slow to iterate compared to Fortnite. Mavericks could be a strong contender among the best battle royale games. Mavericks is built on CryEngine, as well as SpatialOS, which is a cloud-based server platform designed so that games can “go beyond the design limitations of traditional server architectures.” That includes the ability to quickly introduce new updates. You’ll likely associate CryEngine’s rendering abilities with high-fidelity, highly detailed, and demanding games – there’s a reason for the “can it run Crysis” meme, after all – and all that graphical muscle means more effects and art for the developers to work with. But Thompson says the game is built in such a way that that even with those graphical features, updates and changes can come quickly. Thompson admires what Epic has accomplished with the massive battle royale, but thinks there’s room to improve. “Fortnite has done a good job, but also they kind of happened upon battle royale. 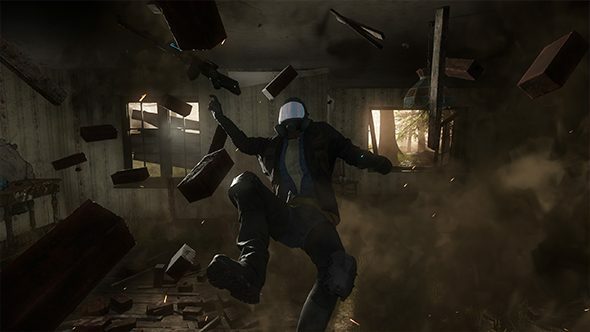 To be honest all battle royale games right now are just another game that has been modded into battle royale.” With Mavericks built on more specialized technology, there’s plenty of room for its ambition to flourish.